Are you lately suffering from a sensation of having an abnormal mass or lump in your throat? If you are, read on to know all about the causes, symptoms, diagnosis and treatment of lump in throat. What is Lump in Throat? As the name indicates, this is an abnormal condition characterized by the sensation of having something stuck in the throat. This is a common problem and many people in the world experience it once or more in their lifetime. In some people, stress and anxiety gives rise to a sensation of tightness in the throat. Stress can act as a triggering factor for this condition and makes the muscles in the throat contract. People who face sudden stressful situations often choke and find it difficult to swallow. The problem refuses to go away even after gulping down liquids or solid foods. In some patients, acid reflux disease might be the cause of throat lumps. The condition involves a reflux or backflow of stomach acids and food particles to the esophagus. This leads to a burning sensation in the chest (heartburn) which is highly discomforting. If heartburn occurs frequently, it can damage the esophagus and consequently give rise to the feeling of having a lump in the throat. Feeling of throat mass can also originate due to tightness of Cricopharyngeal muscle. The sphincter muscle performs the vital role of preventing reflux of swallowed food into the mouth. If this muscle becomes tight, it can give rise to the unusual “throat lump” sensation. It refers to a group of conditions such as panic disorder, phobic disorder and generalized anxiety disorder. These disorders give rise to many emotional symptoms in a patient, which range from anxiety to terror. Patients typically suffer from a wide range of physical problems that have no apparent cause. The condition is very well-known and is characterized by a feeling of inadequacy and despondency. Individuals suffering from depression often suffer from pains and discomforting symptoms without any physical cause. This is a mental disease marked by the appearance of physical symptoms that are suggestive of an injury or physical ailment. Patients of this condition usually suffer from stress and anxiety. They perceive sensations that are seemingly real but not actually existent. Common cold infection is one of the primary causes of throat lump. Infection makes the glands (lymph nodes) in the neck swell and become enlarged. Goiter, which mostly occurs due to iodine deficiency, often leads to a very big lump on the neck. Goiter lumps which are huge in size or cancerous in nature need to be removed by surgical means. Improper functioning of the thyroid gland, which is situated in the throat area, is often a cause of lumps on neck. Malfunctioning of this gland can be a result of disorders associated with thyroid, such as Hypothyroidism, Hyperthyroidism, Graves’ disease and Hashimoto’s Thyroiditis. These ailments can directly result in the formation of hard nodules on the neck. Throat nodules can also arise due to cancerous conditions of the thyroid gland. The lumps arising due to thyroid cancer are usually of a benign nature. The few that are malignant in type may grow and give rise to lumps on neck. These have to be removed surgically. The condition leads to an inflammation of the tonsils. An individual suffering from this disorder usually experiences pain during coughing and swallowing. An infected hair follicle on neck may cause formation of a tiny lump which can be itchy and painful. The blister may swell as a result of pus contained within it. These are blisters filled with yellowish muck that arise as a result of skin irritation or a swollen hair follicle. These are usually painless and tender. A tiny sebaceous cyst is typically benign and resolves on its own. 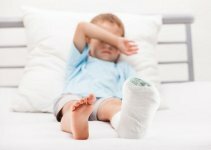 However, a progressively enlarging lesion may require advanced treatment. It is a soft, benign lesion that moves under skin on touch and is visible as a nodule on the neck. It most cases, these nodules do not cause any pain and can be easily ablated by cosmetic surgery. 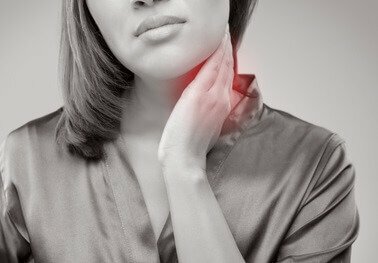 In some cases, throat lump may also arise as a result of a rare condition involving encircling of the esophagus by the thyroid gland. Many people experience a throat lump after eating. This is usually found to be a symptom of a potentially life-threatening syndrome known as Anaphylaxis. It arises as an allergic reaction to certain foods that are perceived as toxic objects by the natural immune system of the body. The immune system produces various chemicals as a natural consequence and leads to an inflammation of various physical organs, such as sinuses, lungs and throat. The sensation of lump in neck is a direct result of swelling within the throat. Patients of this condition need to be treated on an emergency basis. An Epinephrine injection may help relieve symptoms for 15 minutes until more serious treatment is used. Patients should be made to lie on their back, but not with a pillow under their head as it can cause obstruction of the airways. Any lump-like feeling within the throat needs evaluation by an expert healthcare provider. Doctors can simply peek inside the throat to detect an abscess or a pustule on the tonsils. In other cases, further invasive diagnosis might be needed to diagnose an abnormal mass. Physicians may also use other associated symptoms such as changes in voice, hoarseness and difficulties in breathing or swallowing to determine which tests are required for diagnosis. If lump in the throat arises due to depression, the sensation usually goes away with anti-depressive treatment. If GERD is the cause, doctors may use medicines to reduce production of acids from the stomach. If the “lump-like” sensation arises due to anxiety, doctors may use medications and therapies to bring it under control. If psychogenic factors such as somatic or conversion disorders are found to cause this condition, psychological treatment can be used for cure. This involves cognitive behavioral therapy, family therapy and psychotherapy, all of which have some benefits. The treatment of actual neck lumps depends on the actual underlying cause. If salivary glands get enlarged due to bacterial infection, antibiotics, warm salt water rinses and hot compress can help cure the problem. In case of accompanying symptoms like pain or fever, analgesics and antipyretics may be used for cure. If neck lumps develop due to a parotid gland infection, adults should practice good oral hygiene and avoid smoking to prevent its irritation. Lumps arising due to Goiter can be cured by adding iodized salt into the diet. Use of proper medicines at an initial stage can help avoid the development of a large lump on neck. Goiter nodules that are very big in size or are malignant in type have to be removed through surgery. More serious cases of neck masses can involve the use of anti-inflammatory drugs, chemotherapy and surgery. In some patients, an abnormality in tissue construction within the throat can result in a “lumpy” feeling. In many cases, neck lumps go away naturally. This is particularly true in case of a salivary gland infection. In most cases of this infection, good oral hygiene can help clear up the infection without any medical intervention. Apply warm water soaks onto the affected area of your throat. Soak a clean cotton cloth into a bowl filled with warm water. Wring it dry and apply the cloth over the neck. Heat application reduces the inflammation and provides relief from discomforting symptoms. Massage the affected neck region gently. This can help ease tension in the muscles and provides comfort from tension. This helps resolve Globus Hystericus neck lumps. This is a neutral herb that is derived from the dried root of Platycodon grandiflorum. It is bitter and pungent in taste and spreads to the lung channel. It originates from the dried body of the plant Bombyx mori L. It is neutral and salty and pungent in taste. It produces effects on channels of the liver, stomach and lungs. If you are feeling an actual mass in your neck that is constant and refuses to go away despite home remedies, consult a doctor right away. A growing nodule on neck, particularly in case of children, can have fatal consequences and require immediate diagnosis and treatment. If timely treated, a persistent neck lump can resolve in a few days without causing any complications.